From now on words on Lingopolo are introduced in order of frequency of use. What this means is that you will get asked to learn the words in the best possible order. Doubled French recordings to over 600! I am very pleased to say that the French section of Lingopolo is rapidly expanding. Already we have well over 600 recordings (665 at the time of writing). This is already about double the figure of around 300 recordings on 2nd December 2013. Read more about Doubled French recordings to over 600! I am pleased to announce the addition of new progress information: a knowledge score for each quiz (including a global knowledge score for the words or phrases quiz). the knowledge score gives an objective view of how you are doing on each test. The higher the knowledge score the better you are doing. Lingopolo hits 3000 Thai recordings! I am very pleased to report that Lingopolo has now crossed the threshold of 3000 Thai recordings! By the time you read this, the actual numbers will perhaps have moved on, but at the time of writing there are actually 3004 Thai recordings (3004 broken down as: 2031 Thai words, 969 Thai phrases and 22 Thai dialogues). Read more about Lingopolo hits 3000 Thai recordings! Lingopolo has succesfully moved home! I am pleased to be able to tell you that Lingopolo has successfully moved home. Well, successfully moved to a new, and hopefully better web host. I normally don't write in this blog about the behind-the-scenes technical side of Lingopolo, because I prefer to focus on the things which are new and on improved functionality or content. In this case I will make an exception, because it does have an important bearing on Lingopolo: the reliability of the website. Read more about Lingopolo has succesfully moved home! I am extremely pleased to announce the addition of Example phrases Thai lessons. Each of these phrases lessons contains phrases around a particular theme. For example, there is the Animals example phrases lesson, which has phrases all of which contain one or more of the words from the Animals lesson. I am pleased to announce a newly designed home page for logged in users. And this is more than just making things look a bit prettier. In addition to displaying the number of words known, when you login, you will see the number of phrases you know, together with the list of how many phrases there are at each level. 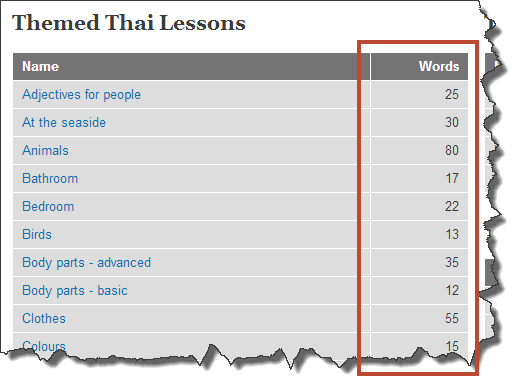 Below shows my current Thai progress with Thai. How are you doing? Whatever your level, keep pressing on! And hopefully the new look will help to encourage you as you see your current progress every time you login. I am pleased to announce the addition of a new Thai lesson: Adverbs of Time. My level of Thai is beginning to creep above the beginner level, and I'm more and more wanting to express myself with adverbs of time, things like now, before that, tomorrow, yesterday and so on. This lesson pulls together all those wordsin one place. Now around 300 French recordings! You can check the French Statistics page at any time for the most recent figures. Read more about Now around 300 French recordings! I am pleased to announce the addition of a "Words" count column for each lesson. This lets you know at a glance how many words are in any given lesson before going into it.